Robbie Brady and Ashley Barnes will hopefully get an outing in Burnley’s Turf Moor friendly against Montpellier on Sunday (kick-off 1-30 p.m.). Brady has only played 45 minutes so far in pre-season, at Curzon Ashton, and he steps up his recovery from knee surgery in December, while Barnes featured at Cork City, before picking up a knee problem. 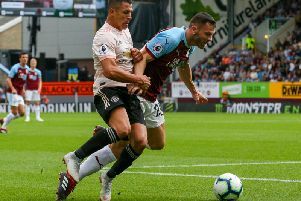 Sean Dyche won’t put out his first team against the Ligue 1 visitors, ahead of Thursday night’s Europa League second qualifying round second leg, but hopes to give his squad players more minutes. Dyche said: “Barnesy is making really good progress. It is only a niggly knee, someone said it is blisters but it wasn’t. “We took him off in Ireland for blisters and they have cleared up. But at this stage, even with this competition, we have still got to be careful. “We all know that the Premier League is still the big thing, not for any other reason than for the business side of the club. “We have still got to find the right balance between getting a team out there that can compete, which they did at Aberdeen, and making sure the players are in good shape for when the Premier League comes around. “Robbie is the same. Robbie is one who will get some more minutes on Sunday in his comeback. “Barnesy we are hopeful of getting some minutes on Sunday but even that now, those games now are not about score-lines. “They are now about getting people through them, especially now we don’t know what has happened with Popey. “We have got the next game in this (Europa) and that is when it gets tricky in pre-season. Dyche knows he could do with a few more bodies, but his search for new signings will go down to the last few days of the transfer window: “We certainly need to continue to work in the market which we are doing. “I’ve mentioned it a thousand times, it is very, very difficult to get the players at the right levels for Burnley Football Club so we try and be diligent and we try and work and at some point we have got to see if we can get something over the line that suits us.